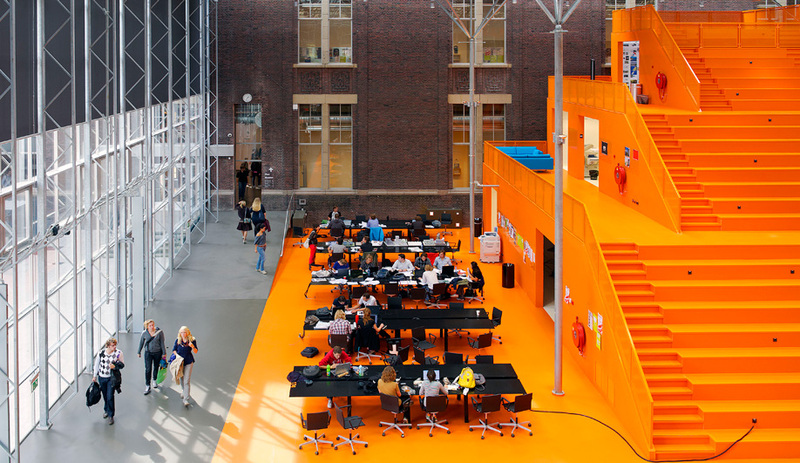 You are here:Home / Architecture / The Why Factory at TU Delft Dares to Ask, Why Not? 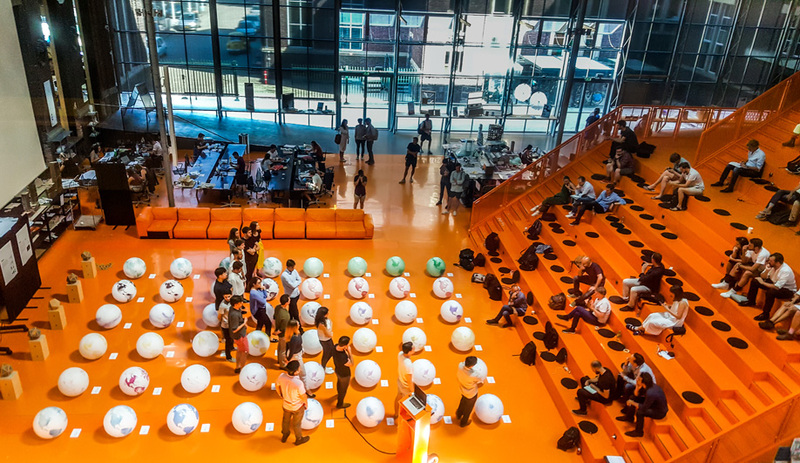 “We invent the future,” Javier Arpa of the Why Factory, the architectural think tank and research centre at TU Delft in the Netherlands, is telling me without irony. We are standing at the top of a towering set of tangerine-hued steps that essentially lead nowhere. The stairs, which double as student seating, ascend to the top of what’s known as the Tribune, a three-storey structure housing the Why Factory’s main offices as well as rooms for meetings and lectures. It is the first week of September and there’s a familiar tension in the air: that unmistakable mix of anxiety and anticipation that marks the beginning of a new school year. In such a heady setting and atop such a lofty perch, Arpa’s words sound more than plausible. 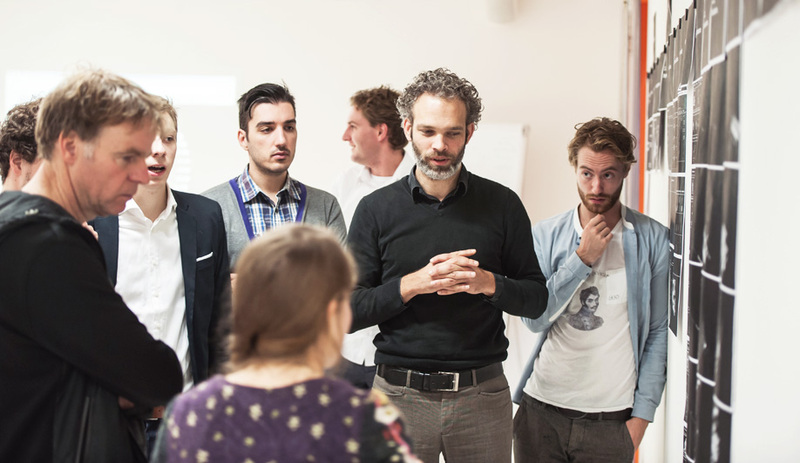 Director Winy Maas leads a design review at the Why Factory in July. Indeed, envisioning the hitherto impossible as possible is the Why Factory’s m.o. Led by Winy Maas, founding partner of the Rotterdam-based architecture firm MVRDV, the unorthodox institute was established in 2007 as a component of the Master of Architecture, Urbanism and Building Sciences program in TU Delft’s architecture faculty. 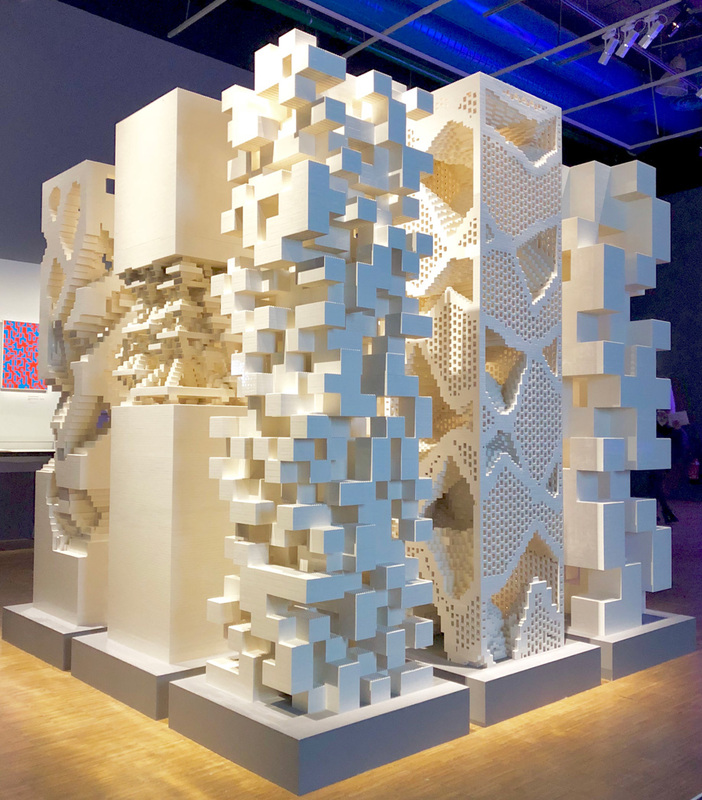 Part hands-on studio and part “future making machine,” it embraces an unconventional – to say the least – approach to design education, encouraging students to think not as architects, but as aliens to this world. That means the curriculum is structured around a lot of fantastical “what if” scenarios that emphasize looking beyond the restrictions of the present to a limitless, unbound tomorrow. What if, for instance, our bodies had an intelligent second skin? What if materials could cater to our every need or we could redesign the entire planet? All are questions that have been posited to and explored by Why Factory students. 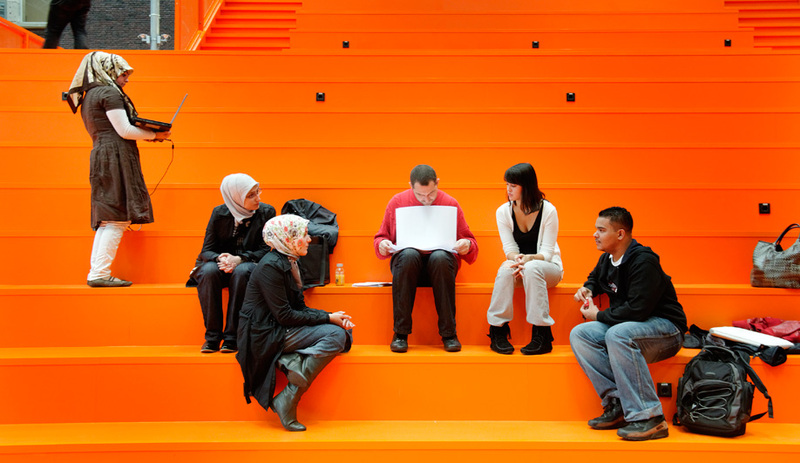 Faculty members Maas (far left) and Tihamér Salij (centre) confer with students in 2012. 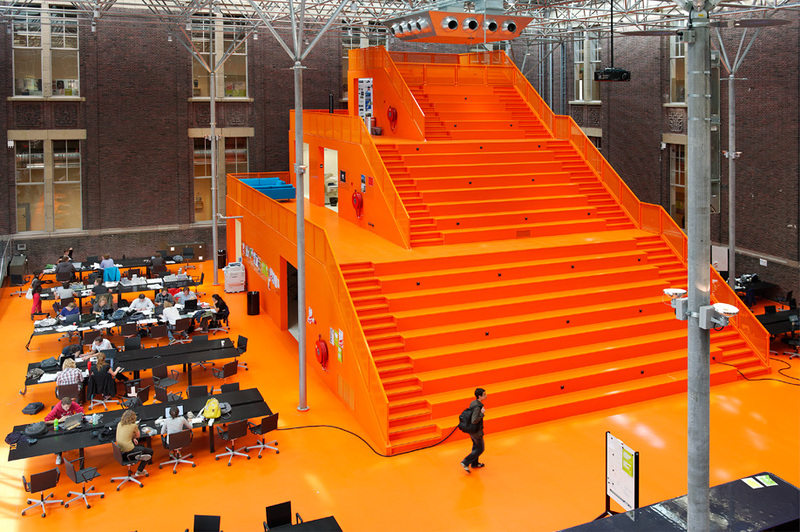 The Tribune, a mammoth orange complex designed by MVRDV, is the Why Factory’s heart, encompassing classrooms, offices and a staircase that doubles as seating. A class discusses 48 “heat map” globes documenting student solutions to problems faced by the planet. The Why Factory’s whimsical setting encourages such speculative theory. 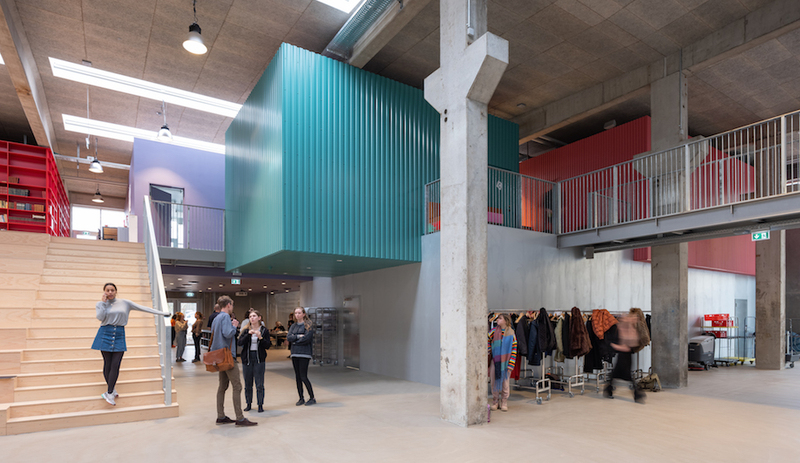 Designed by MVRDV after a fire destroyed the faculty’s original premises in 2008, the vividly tinted Tribune may be the closest thing architecture has to the Wonka Factory. 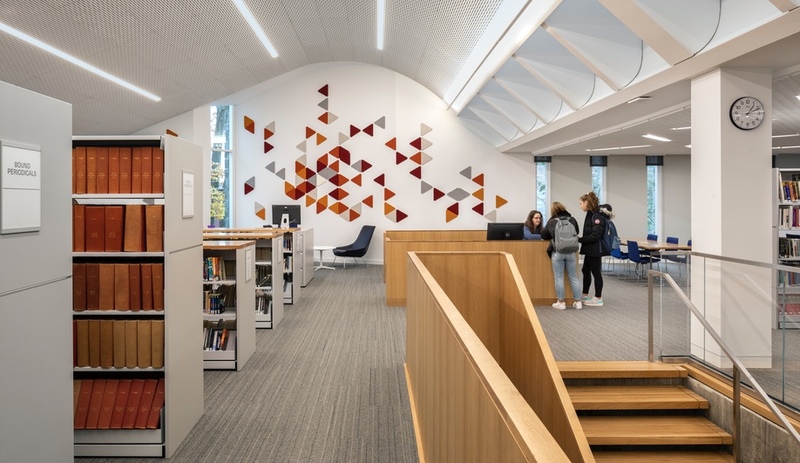 A beacon as well as an administrative and teaching facility, it’s surrounded by a 195-square-metre open-plan studio in which first- and second-year masters students work from flexible furniture designed by Richard Hutten. Made specifically for the Why Factory, the workstations can be easily moved or dismantled to accommodate conferences, exhibitions and other such events (of which there are many). 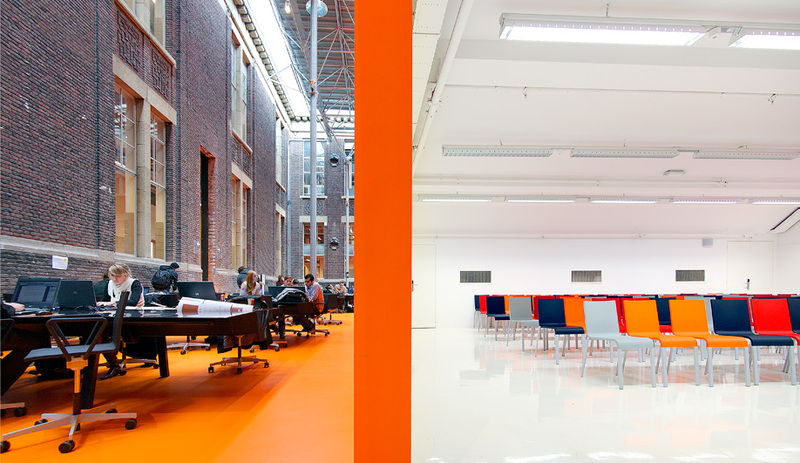 The Tribune, where students both study and socialize, was erected in 2009 after a fire razed TU Delft’s previous architecture school. 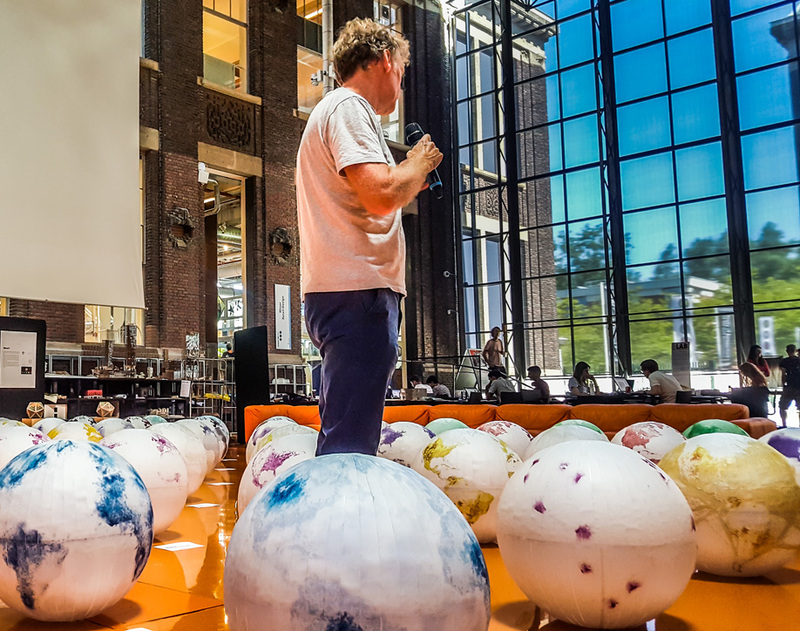 “There are a lot of urban design and architectural studios that teach how to design for tomorrow,” says Arpa, a professor, theorist and TU Delft graduate who joined the Why Factory as its research and education coordinator in early 2016. “What we’re interested in is what happens after that – not tomorrow but after tomorrow. That’s what defines us.” A former architect who worked for several years as editor-in-chief of the European design publication a+t and as a curator at the Architecture League of New York, Arpa is a well-known figure in the world of design academia, frequently travelling the globe to give talks on urban and architectural possibilities. For him, the date that designers should be focused on is not next year or even 10 years from now, but 2100. Salij, who worked at the Why Factory from 2007 to 2015, listens with Maas as a student discusses a project. Every year, the fruits of student research are released in book form by Holland’s nai010 publishers. This aim sets the Why Factory apart. 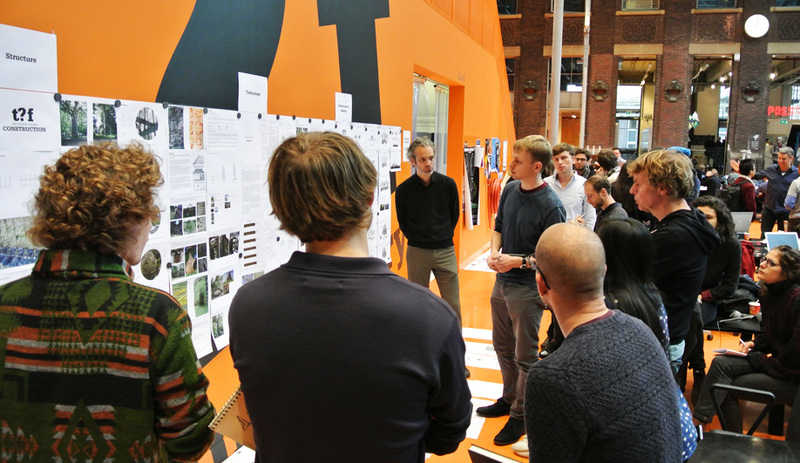 Ranked among the top architecture programs in the world, TU Delft’s two-year Masters of Architecture, Urbanism and Building Sciences takes four semesters to complete, each one four months long. Every September, the faculty outlines all of its streams for incoming students. Based on these presentations, the students choose the top three studios they’d like to be placed in that year. The Why Factory is one of the most popular. Students in their first year there follow a customized curriculum including two history-of-design courses, a seminar, a workshop and studio work. Advanced studio modules take up the second year. 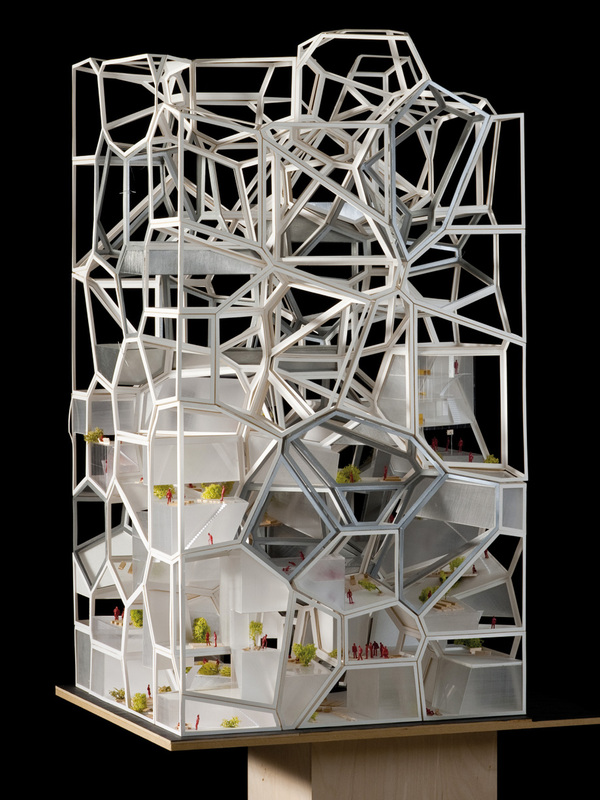 A model of one of the “vertical villages” envisioned by Why Factory students in 2009 as a blueprint for urban development in Asia. “The books are a big part of what we do – they’re how we start our studios,” Arpa says, referring to the fact that each proposed book’s table of contents, established early in the year by professors, serves as a guideline for the students’ research. 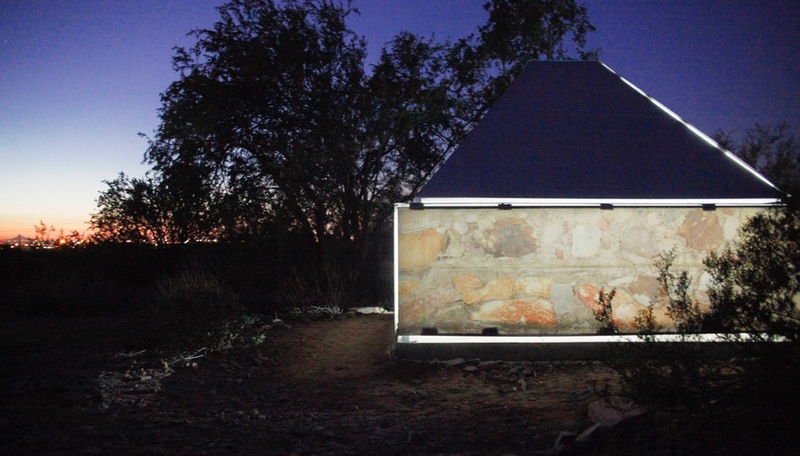 The Actualities Workshop, meanwhile, takes the studio out into the world. Consisting of short-term projects that often last less than a week, it looks at developing solutions for current urban challenges. This semester, students will travel to the bustling port of Marseilles, where they’ll be asked to “take an alien’s point of view” while fabricating visions for the city’s multicultural future. The PoroCity installation on display during the Pompidou Centre’s Coder le Monde (Coding the World) exhibition this past summer in Paris. Not surprisingly, the research conducted under Maas’s direction at the Why Factory often trickles back into his own practice. “There is a certain relationship between what is studied here and what is produced by his office,” says Arpa. The PoroCity project, which was shown at the Pompidou Centre and explored the ideas of porosity and transparency in urban settings, is one such example. “The question was: ‘What if the city were to be completely transparent?’” Arpa recalls, noting that students then studied architectural transparency in all of its past, present and (potential) future forms. By the end of the year, the group had developed a plethora of “porous” designs ranging from buildings to apparel. MVRDV’s famous Chanel boutique in Amsterdam, featuring a facade composed of high-gloss transparent bricks, opened a few years later, in 2016. 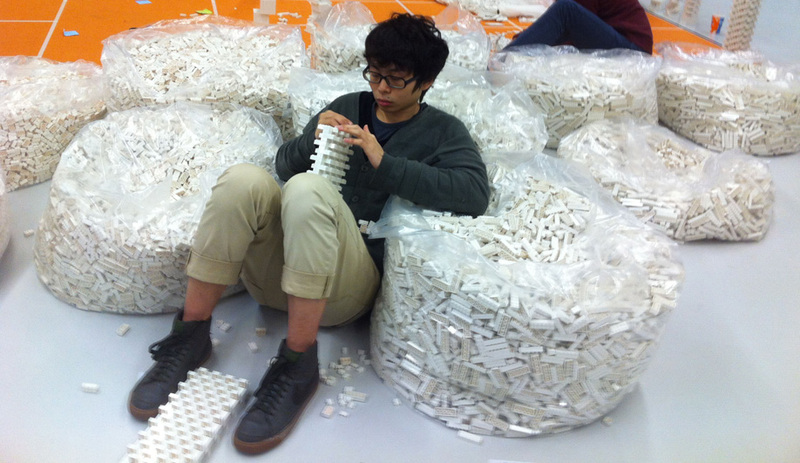 A student uses Lego blocks to assemble “porous tower” models during a satellite Why Factory workshop at Hong Kong Design Centre in 2012. 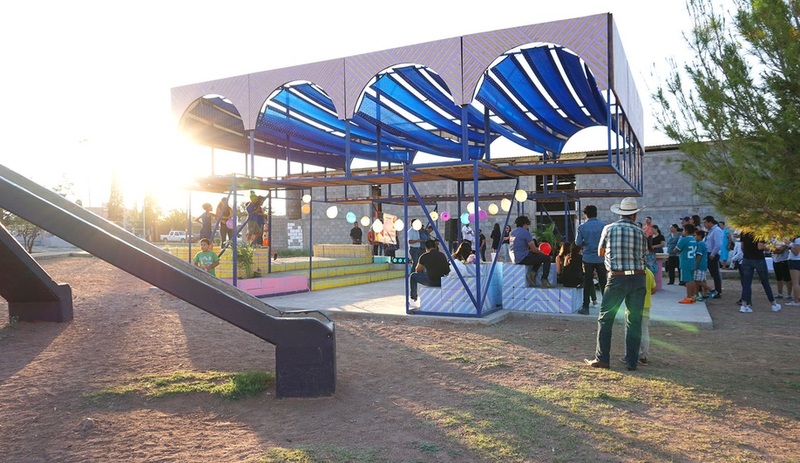 PoroCity, the program’s 2012 exploration of transparency in urban settings, was featured most recently in an exhibition at Paris’s Pompidou Centre. 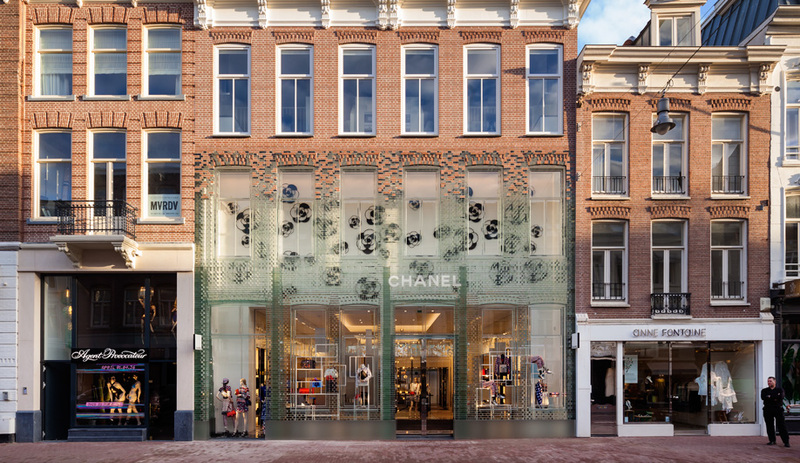 In 2016, it influenced MVRDV’s design of Chanel’s Amsterdam boutique, the facade of which is composed of see-through glass blocks. 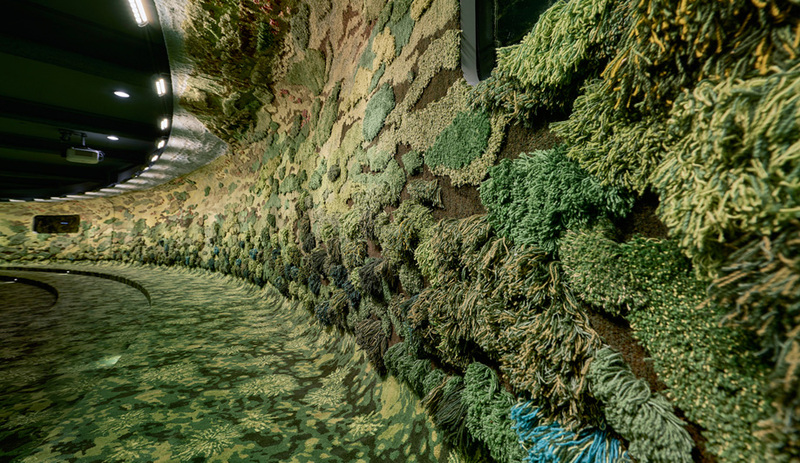 In 2017, MVRDV teamed up with Argentinean textile artist Alexandra Kehayoglou to transform a 240-square-metre lecture room in Taiwan into a green fantasia carpeted with lush swathes of recycled thread. The idea was based on Why Factory research into transformable environments. 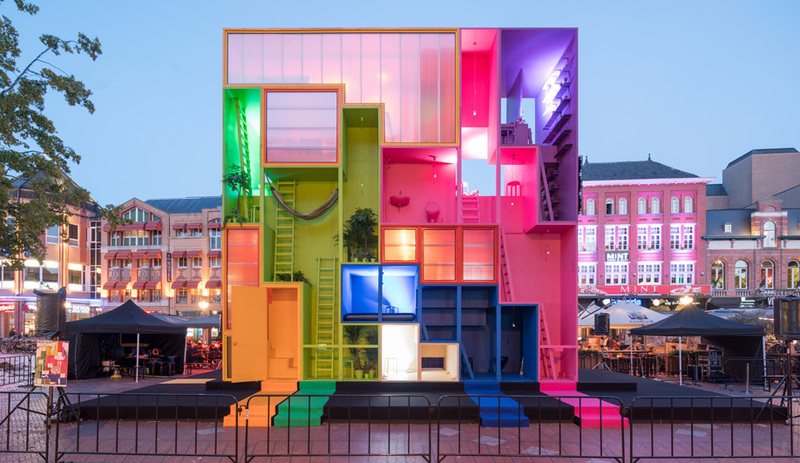 Designed to showcase how flexible buildings can and must be to accommodate the families, students and refugees of tomorrow, this multi-hued, Tetris-like concept space created by MVRDV in collaboration with the Why Factory was erected during Dutch Design Week last year. It began with the question: What does the future city look like?